Explore “The Legend of Sleepy Hollow” in the author’s home! 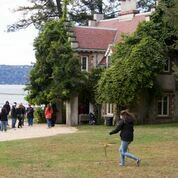 Take a spooky tour of Washington Irving’s cottage and learn about the history of hair-raising stories and 19th-century crazes —like vampire scares and séances. Create Halloween-themed art activities, explore the grounds on a literature-themed scavenger hunt, play historic games, pose for a spooky photo op, and take in a shadow puppet performance.